If you like a lighter topper then this is the pad for you. The pale pink topper sits very well with the pretty purple clouds. 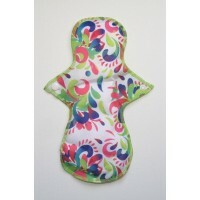 This pad can be used as a day pad for a regular flow period. The pad has press studs on each wing to ensure they stay in place whilst in use and they can also be folded away for extra discretion. 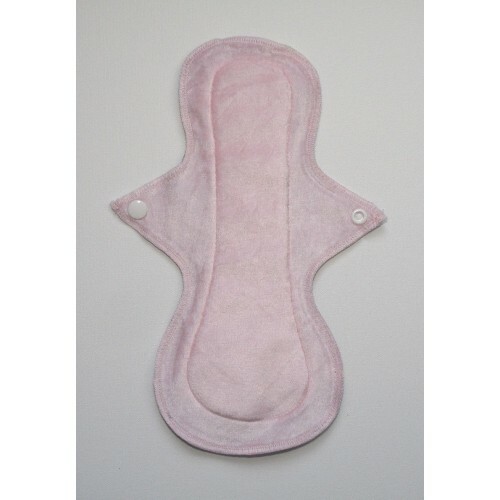 This pad comprises of a bamboo velour top layer in pale pink, an absorbent core layer followed by a clouds design waterproof PUL layer. 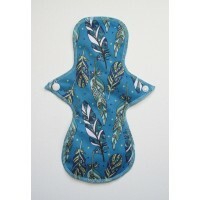 These pads are designed to be worn pattern down. The liners can either be soaked in cold water immediately after use or placed in a wet bag (please see my shop for wet bags in different sizes, small size is perfect for liners.) If the liner hasn't been soaked in water I recommend putting on a rinse cycle before washing. Then they can be washed on a normal wash up to 40C without fabric conditioner as this affects absorbency. They can then be hung to dry. This cute mermaids design goes perfectly with the super soft sea green bamboo velour topper.This p..
A lovely cornflower blue feather designed pad with a light blue topper.This pad can be used as a d.. Bright colours like these need to be seen. The lime green topper makes the carnival design pop..